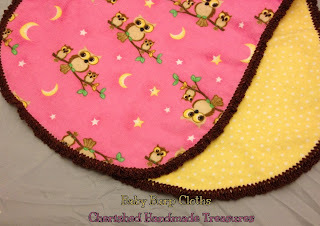 A while back, I visited a friend and she showed me a cute burp cloth she was crocheting. She had actually done several and had them tucked away for new baby gifts. One of the stitches was this X and O stitch. I made a few of these before I made the cute little doll blankets and burp cloths for my granddaughters for Christmas. A few I used for groups giveaways I joined and a couple more went as baby gifts. I really love this stitch—it’s so easy. Not only is it super simple, but it works up so fast! Only one round and your done. I didn’t have a pattern for this—I just looked at one of my friend's completed burp cloths. But it’s so simple, you really don’t need one. Repeat from * to * until you have gone all the way around, ending with one SC in the crossed over stitch.